Formula 1 will make its second visit to the Baku Street Circuit this weekend, with tyre manufacturers Pirelli bringing the Medium, Soft and Supersoft tyre compounds to Azerbaijan. Mario Isola, Pirelli’s Head of Car Racing, says that unlike the previous two street events in Monaco and Montreal, Baku would not suit the Ultrasoft tyre, mainly due to its higher speeds in the final sector, and as such the same compounds that were brought to the inaugural event in 2016 will be brought again this season. Isola admitted it was a surprise that the 2016 event did not have a safety car period, but teams will still need to factor the possibility of one this year into their strategies. “Following Monaco and Montreal, Baku is the third non-permanent, low-grip venue in succession, but it has a very different character,” said Isola. “The lap is a lot faster, with more energy going through the tyres, and track temperatures could be very high, like last year. “For these reasons, we’ve chosen a range of tyres in the middle of the spectrum, which worked well in 2016. Maybe a surprise back then was that there were no safety cars, despite predictions to the contrary, so this could be a factor to consider when formulating race strategy. Both the Mercedes AMG Petronas Formula One Team and Scuderia Ferrari have gone the same way when selecting the number of sets of each compound they will bring to Azerbaijan, with Lewis Hamilton, Valtteri Bottas, Sebastian Vettel and Kimi Raikkonen all only having one set of the Medium compound. All four drivers also have four sets of the Soft, and eight sets of Supersoft tyres, with the same combination also being selected by Lance Stroll, Romain Grosjean, Kevin Magnussen, Nico Hülkenberg and Jolyon Palmer. 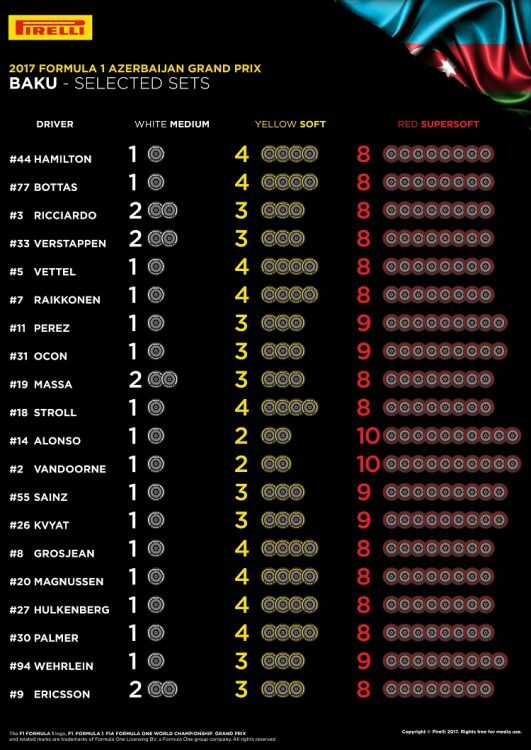 The two Red Bull Racing drivers, Daniel Ricciardo and Max Verstappen, have gone for two sets of Medium tyres, three sets of Softs and eight sets of Supersofts, with Felipe Massa and Marcus Ericsson also choosing this combination. Sergio Perez and Esteban Ocon, the two Sahara Force India F1 Team drivers, have chosen one set of Medium tyres, three sets of Softs and nine sets of Supersofts, with the same combination also being chosen by Carlos Sainz Jr, Daniil Kvyat and Pascal Wehrlein. The McLaren Honda Formula 1 Team have gone even more radical in their choices, with both Fernando Alonso and Stoffel Vandoorne selecting one set of Medium tyres, two sets of Soft tyres and ten sets of Supersoft tyres.